Achillea millefolium – Achillea refers to the Greek hero Achilles, who supposedly used this plant to heal soldiers’ wounds. in Latin: Achillea millefolium L.
Achillea refers to the Greek hero Achilles, who supposedly used this plant to heal soldiers’ wounds. Millefolium relates to the many-divided, fern-like leaves, or “foils”. (“Mille” means “a thousand”). The name “yarrow” is said to have originated from Scots Gaelic, where it means “rough stream”. The name “milfoil” refers to the finely dissected foliage, the name being taken frommillefolium. The French name “herbe à dindes” is a ‘Canadianism’ based on the use of the plant to feed turkeys. Other less-known names include knight’s milfoil, herbe militaris, staunchweed, bloodwort, and soldier’s woundwort, which refer to the plant’s use in the military to heal wounds. Common yarrow is a herb (a non-woody plant) about 30 cm to 70 cm tall. It has several stems rising from a branched rootstalk, and is strongly scented. Leaves: Leaves are aromatic if crushed, feathery, 4 cm to 15 cm long, silky-hairy, and blue-green. Flowers: Flowers are white (or rarely, light pink). Many small flowers form a roundish-topped dense cluster about 4 cm across. Fruit: The fruit or seed is small, flattened, dry and hard. Common yarrow grows along roadsides and in moist meadows and openings in the boreal woods or the parklands. It is often found in disturbed areas where the soil has been turned over. A native plant, it establishes easily in open areas such as pastures, meadows, lawns, roadsides, and waste ground. It does not tolerate shade well, but grows very well on poor soils. It flowers in late June, and can continue flowering into September. 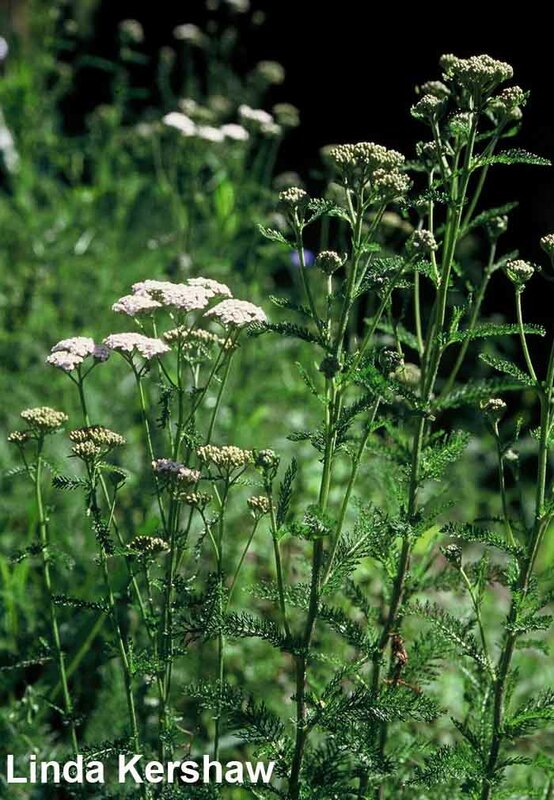 Although yarrow can occur near lake shores and stream edges, it is quite drought-tolerant. Its ability to withstand dry conditions is due in part to a deep, extensive root system. Yarrow is a member of the Asteraceae (daisy) family, which includes plants generally thought to be self-pollinating. When the flowers close at night, the female flower parts (styles) touch other florets and pick up pollen. Cross-pollination by insects probably also takes place. 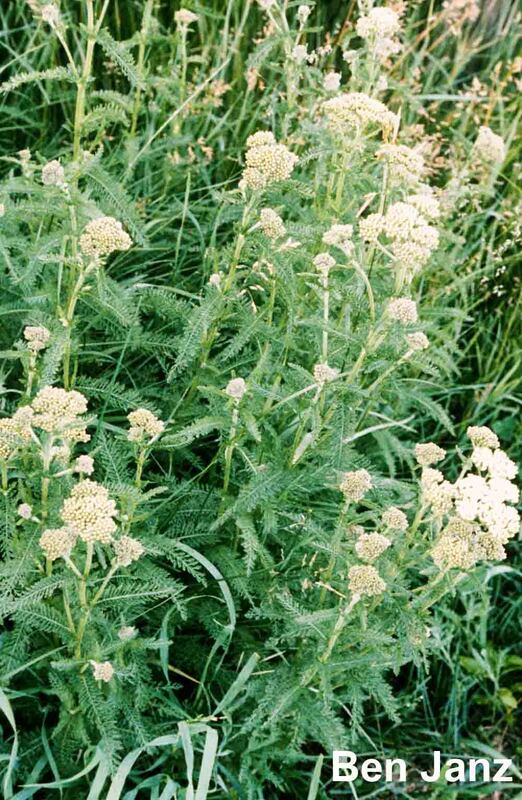 Despite its bitter taste, some domestic livestock (notably sheep) and deer consume yarrow. The flower is actually a large cluster of several flower heads that provide a rich and abundant source of nourishment for insect larvae and certain butterflies. Look for blue copper butterflies (Lycaena heteronea heteronea) which nectar on yarrow. While male blue coppers are a brilliant blue colour, females are duller blue or gray-brown. 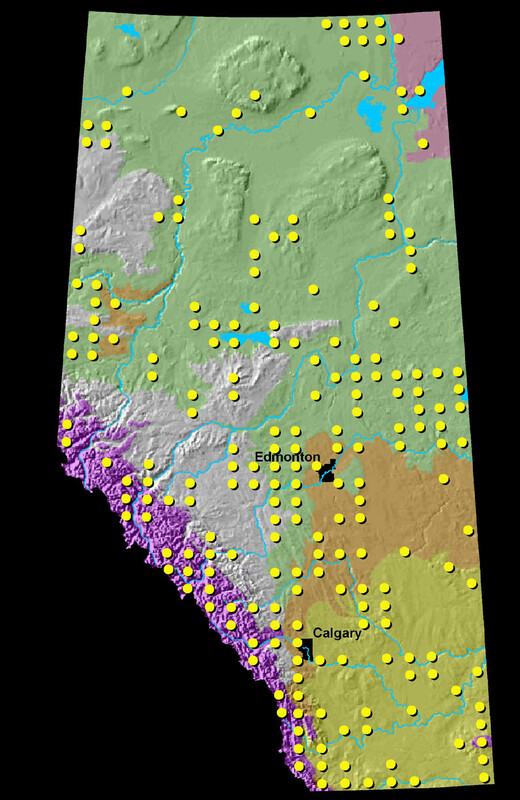 This species ranges from the mountainous regions of southern Alberta and British Columbia south to New Mexico and California. Yarrow is a common flower throughout Canada that sometimes turns entire fields white when the flower is in full bloom. Look for this flower with other members of the same family begin to bloom, like purple asters or yellow goldenrod. Flowers in late June, and continues flowering into September. Common yarrow has many medicinal properties that were used by First Nations Peoples. This plant was used to treat headaches, stings, cuts, sores, burns, and nosebleeds, to name a few of the many medicinal uses. 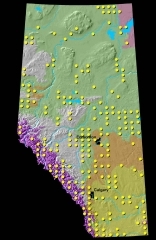 Rocky Mountain First Nations used the mashed roots as a local anaesthetic. In ancient times, common yarrow was used in wars to stop the bleeding of wounds. In Greece, it is a symbol of war. Yarrow has proven effective as a medicinal herb and is considered safe by Health Canada for international consumption, although allergic reactions sometimes occur in people sensitive to the daisy family. Today, it is still used mainly as a tonic and as a cure for stomach disorders. Yarrow is present in more than 20 pharmaceutical products marketed in Canada, and is very popular in commercial European herbal remedies. In the Middle Ages, yarrow could be found stored in household medicine cabinets as well as convents and monasteries. Yarrow was previously used as poultry feed (hence the French name). Cows grazing on yarrow may produce milk with an undesirable flavour, but cattle seem to avoid it. Young yarrow leaves are sometimes consumed (cooked or fresh) in salads (although large amounts are said to make urine brown). The leaves and flowers are used to flavor liqueurs, and were once substituted for hops to flavor beer. Yarrow was once used in Ireland for love divination: young girls would cultivate a yarrow plant and subsequently place it beneath their pillow so that they would dream of their sweetheart. It was brought by bridesmaids to weddings to ensure seven years of love. This plant is widely grown as a vigorous ornamental in Canada, and there are numerous attractive cultivars with deeply-coloured flowers. In some areas, it is recommended as a groundcover to control soil erosion on slopes and hillsides. Its capacity to spread by rhizomes makes it valuable for this application. Yarrow is also recommended as a low-maintenance, infrequently mowed lawn. However, before creating a “yarrow lawn”, be aware that once planted, it is a very difficult plant to remove. Vigorous attempts are made by some to eliminate it from lawns, where low-growing ecotypes are capable of blooming under the law mower blades. Because yarrow has insecticidal constituents, it has received a reputation as an insect-repelling garden plant that dissuades visits from some ants, flies, and beetles. Features of yarrow make it easy to adapt as a crop. Germination percentages are generally high, and the seeds only need to be scattered on the soil surface. Seeds sown in the autumn germinate in spring, produce sturdy rosettes the first year and reach mature flowering size in the second year. Since they are perennial, the plants grow back after harvesting of above-ground parts. An additional potential benefit is that some populations yield sufficient nectar for honey production. 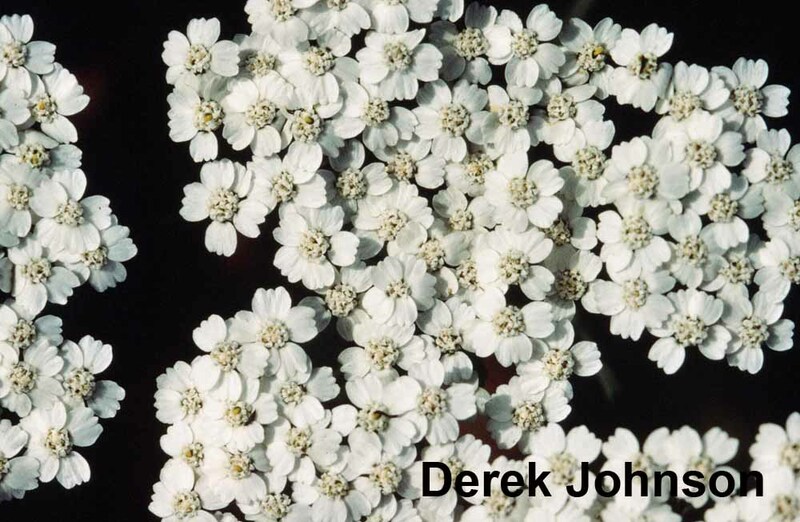 Yarrow’s ability to grow in poor soils of various moisture regimes, as well as its adaptability, makes it a relatively undemanding crop that can be grown throughout much of Canada. Small, E. and P. M. Catling. 1999. Canadian Medicinal Crops. NRC Research Press. Ottawa, Ontario.